Sandra is survived by: her loving husband, Eric Clifford Carter; her children, Clifford Jr. (Kathryn), Shannon (Bob), Tania (Joshua), Tyler, Travis, and Michael (Ashley); her grandchildren, Maygen, Aurora, Olivia, and Alenna; her great-granddaughter, Maiya; her brothers, Louis "Buddy" McArthur, Eugene Pasap, Kelvin Pasap, and Roderick Pasap; and her sisters, Carol Eichhorn, Diane Pasap, Doreen Pasap, Caroline Standingready, and Donna McArthur. She was predeceased by: her father, Stephen McArthur; her mother, Ethel Pasap; her brothers, Maurice McArthur, Edward Pasap, Richard Pasap, Ross Pasap, Patrick Pasap, Steve "Woody" McArthur, Wayne V. McArthur, Greg Pasap, Ronnie McArthur, and Clarence Pasap; her sisters, Barbara Pasap, Courtney Pasap, and Roberta Pasap; and her granddaughter, Heaven Angel Carter. Sandra was born on the White Bear Reserve to a large family, early years were spent in a day school, then a residential school, then at a high school in Prince Albert. She was visiting for the summer holiday with her friend, Pauline White (nee Harper) when she met her future husband of 45 years. They got married on November 30, 1974. Those early years, they worked as teacher aides. She wanted an education, so she enrolled in the ITEP program in Saskatoon and the next year was joined by her husband. Those were hard years with a growing family. She graduated in 1981 with a post graduate degree. 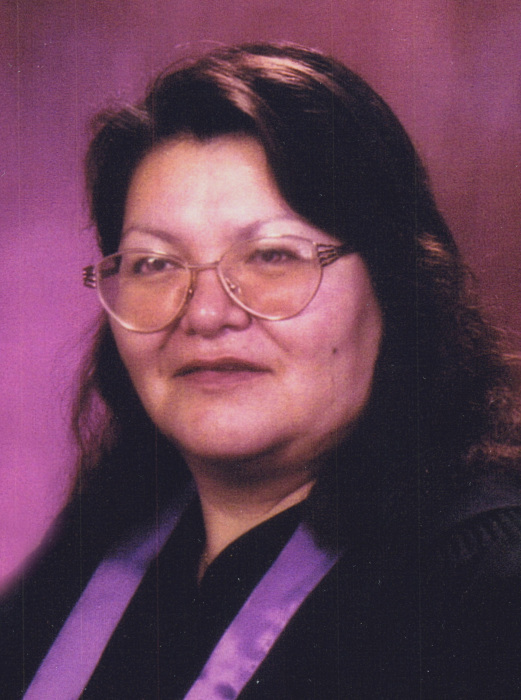 Sandra worked for the Onion Lake Education System for around 26 years in different capacities: teacher, guidance counsellor, vice-principal, director of daycare, and one year as the principal on the White Bear Reserve. Sandra was always very cultural and it was during her teaching years that she took part in sundances, her love for horses brought her to a horse sundance (8 years), in Fort Berthold, North Dakota. Her brothers and sisters were very supportive of her. Remembrance Day meant a lot to her, her dad and four uncles served in the army. Three returned and two were buried overseas: Edward McArthur, buried in the UK, and Daniel McArthur, buried in the Netherlands. Sandra enjoyed teaching, and always enjoyed meeting all the students she taught, also her co-workers at the school and at the daycare. It was while she was working at the daycare that she was forced to retire due to health reasons.